To properly maintain your fire and your fireplace you need to have the proper tools. These tools include tongs, brooms, brushes, shovels, and, last but not least, the most versatile tool of all, the fireplace poker. 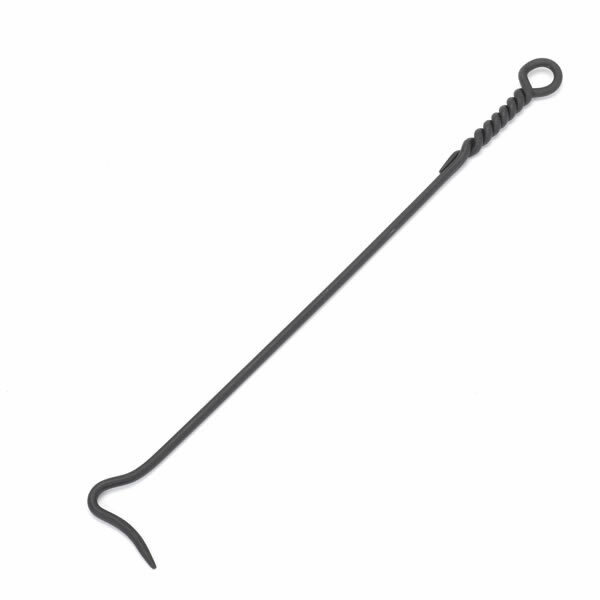 This fire poker, made by Minuteman, is made of the traditional and classic black wrought iron. It has an attractive decorative twisted rope design. The twisted rope makes the handle with a ring on the end so you can hang it up next to your firebox. Is this Minuteman fireplace poker sturdy enough to use for an outdoor stone fire pit? This is hand forged wrought iron and will be quite sturdy, but not designed with the intention of being left outdoors. Unless coated properly as a preventative measure, anything wrought iron will rust if left outdoors. How long is the short end of the L shaped poker? Per the manufacturer, the short end of the poker is approximately 4 1/2 inches long. What is the diameter of the iron? Per the manufacturer, this item is made of 1/2 inch diameter wrought iron. Well made and functional - love the looks too. Very heavy duty. The product came well packed. It is very solid and should provide years of use. ProsFeels very durable. Like loop at top so it's easy to hang up. ConsWish it was a little longer. Awesome tool, rugged and dependable !!! Great experience.Cant wait to use it daily !!! We were able to get this nice poker at a nice price. It does just what it was made to do and that's poke and move wood around the fireplace. We have this really huge fireplace that is very deep. This poker has a really long length to it and we are able to adjust wood quite easily. I would very much recommend this poker. My spouse is very pleased with his new poker. He says it is very well made and that it is difficult to locate quality accessories. It's hard to have many words to describe a poker for the fireplace, but this particular poker seems to be solidly made and sure to last me for many years. We bought this tool to use with our outdoor fireplace. I really like the look of the design and it works just great! I have owned many pokers in my life and this one is by far my favorite one. It is very sturdy and has an attractive design to it. I really like the sturdy feel of the handle. This poker has a nice rope design for a handle grip. It appears to be made of a solid, cast iron that does a great job of moving and adjusting logs in the fireplace. We like to hike and camp a lot as a family. I was looking for a nice poker that I could buy without having to buy the whole set. I really like the design of this poker and we take it with us whenever we go camping. I think it is a good value considering what we paid for it and how often we use it. I will be sure to recommend it to others.